When we took on the allotment last January, we inherited a pretty substantial herb patch consisting mostly of a well established giant purple sage (Salvia officinalis "Purpurascens") plant and rosemary bush of unknown variety, mixed in with some oregano and thyme and something I could not identify at the time which turned out to be a a kind of giant daisy. 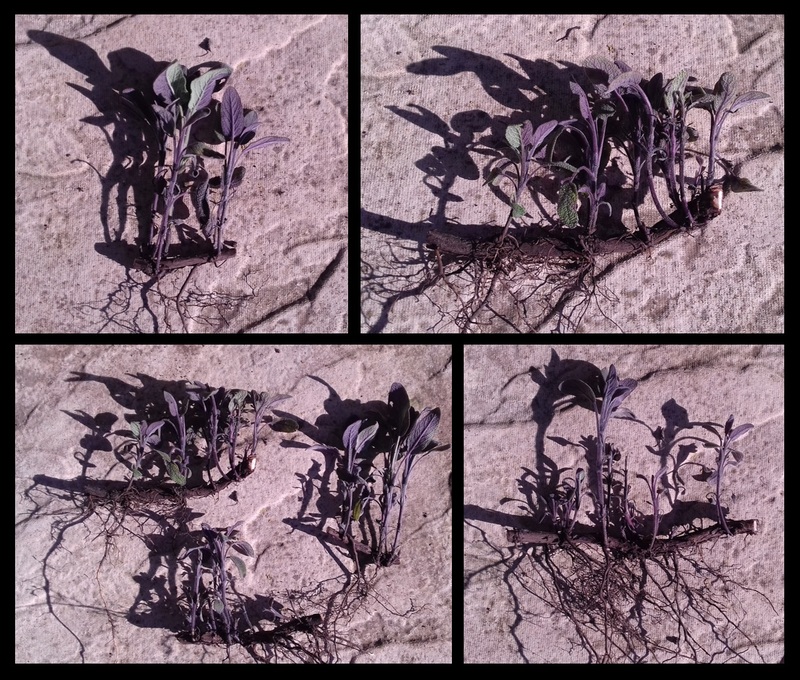 Thrilled as I was that I have all these plants, as the year went on I have not used the sage at all. 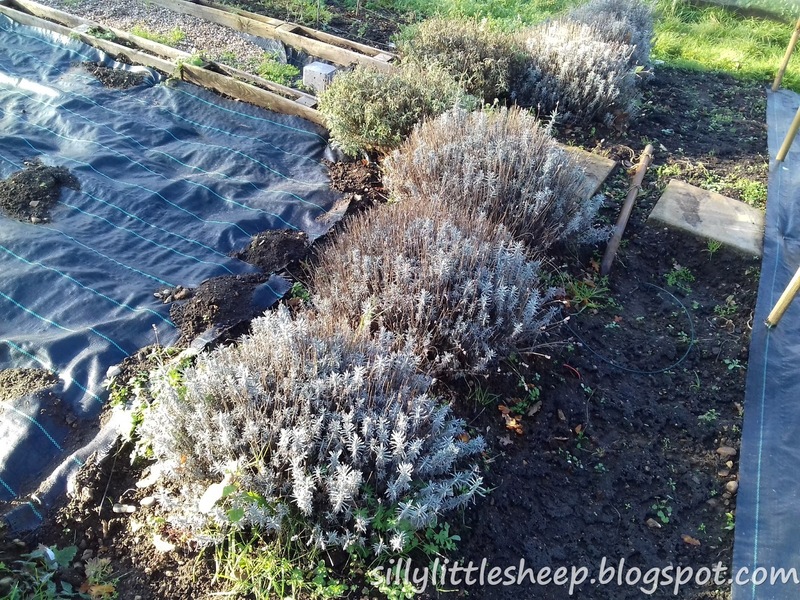 I tried to reduce its size and gave the off-cuts away to friends to use in the kitchen but it wasn't until last week that I decided to go about it a bit more brutally and give it a proper prune. 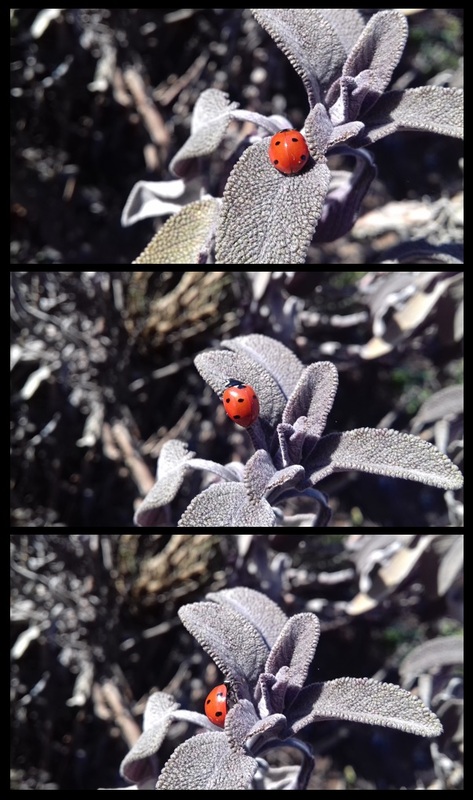 I was thinking about getting rid of it altogether, but as it is a good feed for pollinators, I decided to keep it. Moreover, I have read that drinking water infused with this plant can help with sore throats - something that I sometimes suffer from as a teacher. Cutting away the lowest and widest branches I noticed that those that were lying down and touching the soil have developed roots. This is a commonly used method for propagating the plant asexually called "layering" - covering a lower branch with soil, waiting for roots to develop and then cutting it off and thus getting a separate plant. I am not sure whether the previous owners have done this intentionally or whether it just happened but I separated sections of those branches which gave me some really healthy looking cuttings. I potted and watered them and I keep them in a shady spot behind the shed. 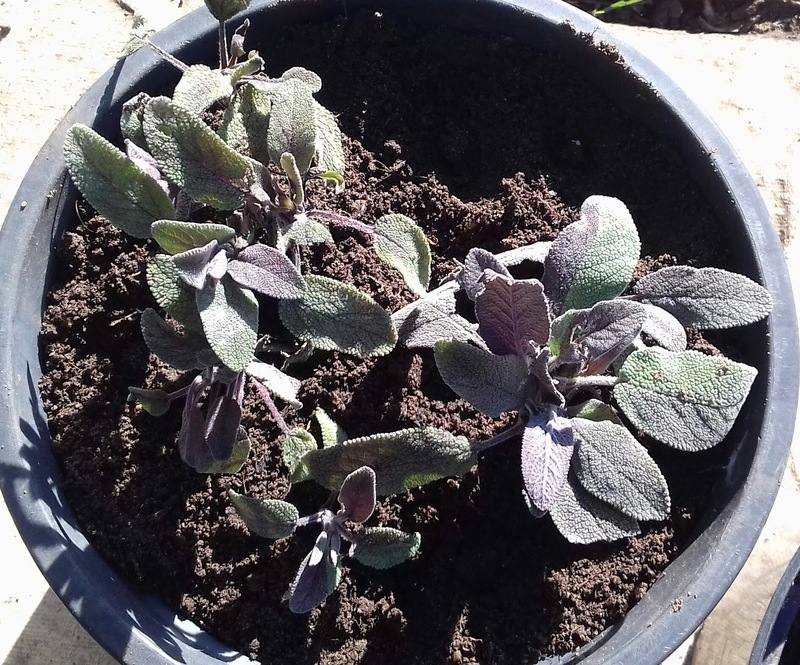 I now have eight plants that I definitely do not want to keep but I am thinking I might give them away or wait until our allotment association's open day where I am sure we will have a plant sale. Three of the cuttings in their new pot. Pretty, aren't they? 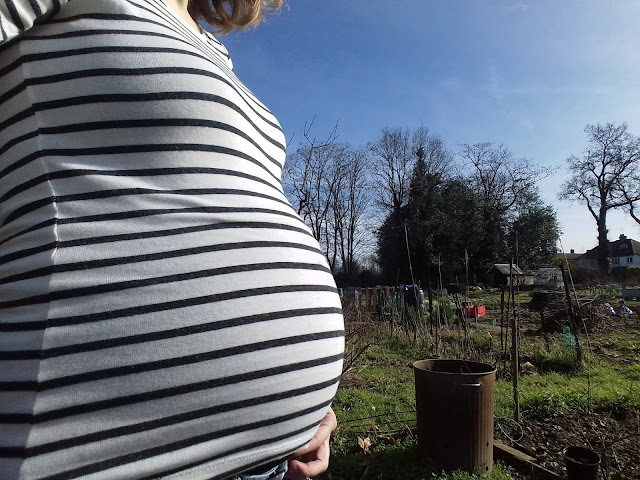 A perfect day to take the bump out for a bit of fresh air. 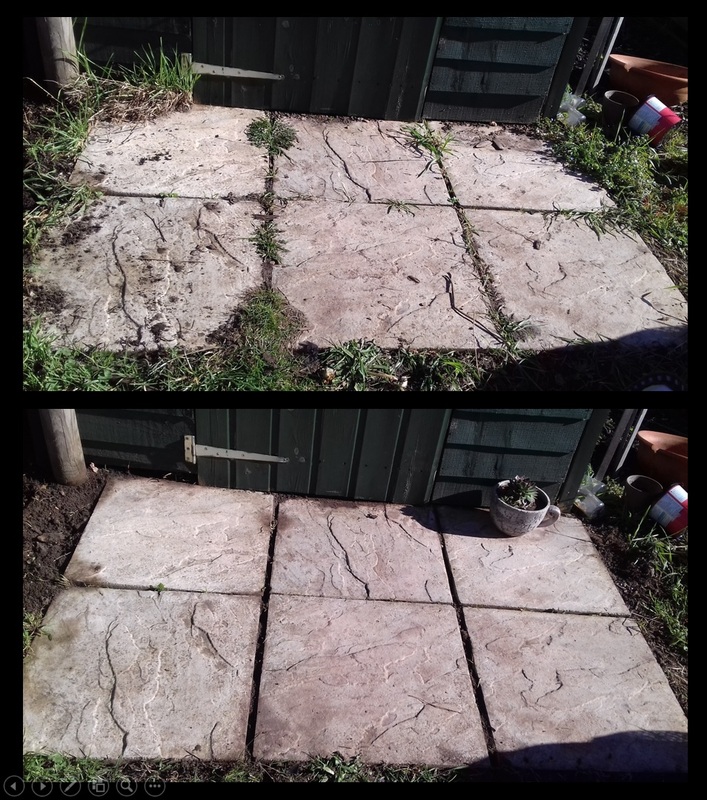 The patio before and after. 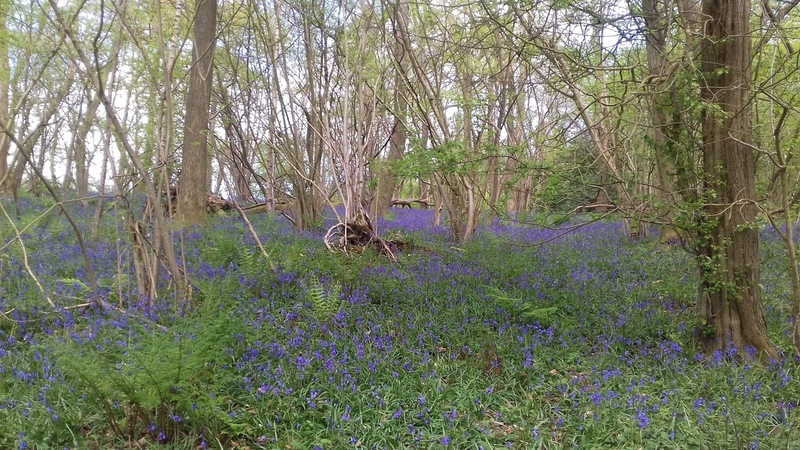 Having been very excited about getting our little 5 rod patch of land in January, I am quite sad that this year’s growing season did not go to plan. I fully intended to visit the plot almost every single day during the summer holidays, but it turned into not having been there for almost two months straight and coming back to a plot full of overgrown squashes and thriving annual weeds. Why? Well, that is the happy bit – instead of veg we started growing a baby! J And I started suffering from such bad morning (and day and evening and sometimes night) sickness, that I could barely eat anything more than rich tea digestive biscuits and water crackers. Moreover, every smell, whether it was my husband’s deodorant, neighbours cooking with garlic or lavender or dry grass on the allotment site was making me run and shout “Europe!” at the toilet. It was a month and a half of hormonally induced digestive torture but now that I am back to normal and eating well it seems to have been just a small unpleasant rough patch in the grand scheme of things. Talking about rough patches, the plot is definitely a big one to handle. 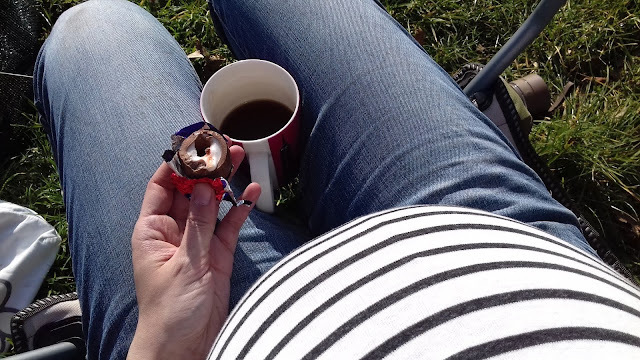 I like to think that whatever we do, there's always two of us doing it - even though I am the one putting in muscle work and the baby is just sleeping, wiggling and packing me an occasional kick or a punch from the inside. 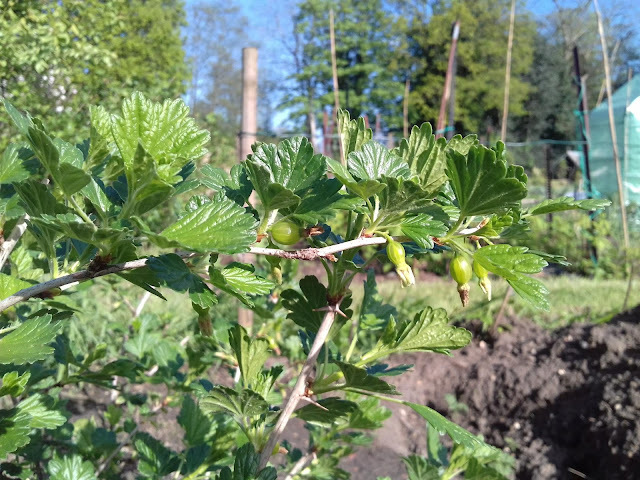 So we have spent two days gardening together so far, uncovered some plants that were hidden in the weeds and gradually cleared one small area next to the gooseberry bush. Not everything has suffered during my absence. 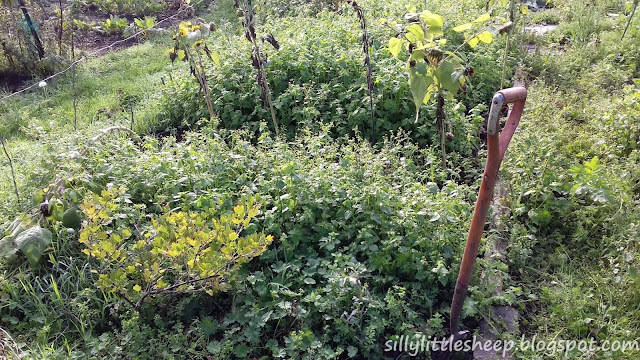 The mint that looked very poor in the hot summer has benefited from the rains and re-grew itself beautifully. I love brushing against it on my way to the shed and enjoying the fresh scent of the leaves and I look forward to drinking a lot of fresh mint tea on the plot later. 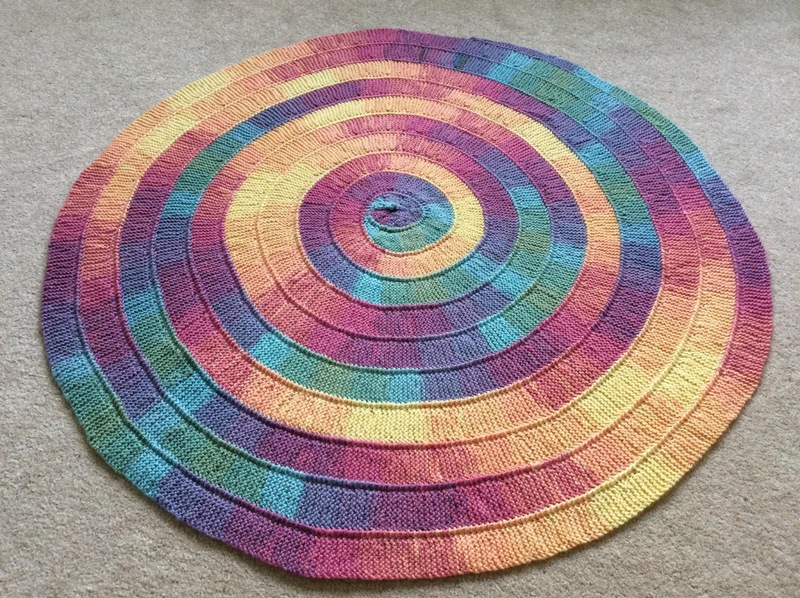 I have finished my first circular blanket! What a journey! It was one of those projects that I really liked working on, then wished it was finished already and once it was finished and I was taking photographs of it I felt sad that it was over. Who knew that knitting can turn you into such an emotional mish-mash? 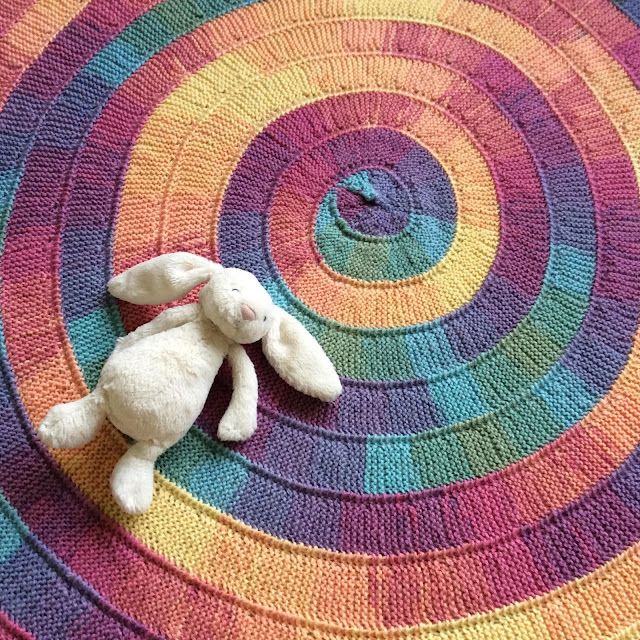 Teeny (Bashful Bunny by Jellycat) is enjoying a few moments of rest on this new blanket before it gets given away. The original pattern is Ten Stitch Twist by Frankie Brown which is available as a free download on Ravelry. The yarn used is Sirdar Hayfield Spirit DK in a shade called Sundown. It was very pleasant to work with. I used 3mm needles because I like the knitting to be quite tight but in retrospect I would use slightly thicker needles (maybe 4mm) as they would not affect the tightness that much but would help the blanket be finished a bit faster. I used it to cover my legs whilst I was working on it and it is toasty warm. 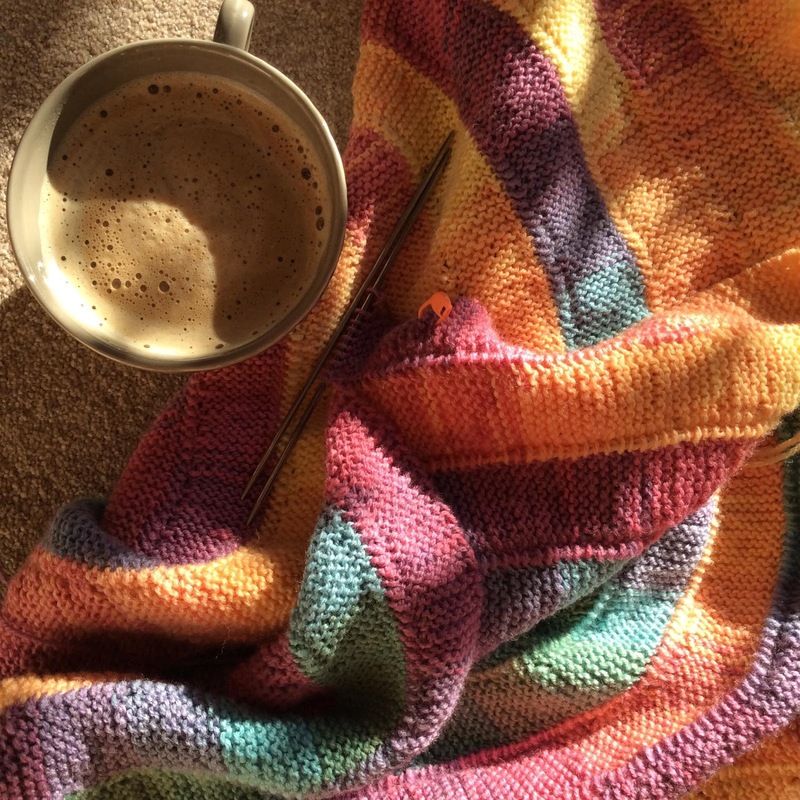 I have taken this blanket on holiday and have knitted at my parents' house and spent many happy moments with it whilst sipping coffee and watching TV. However, I kept getting distracted and missing the point where I have to knit and turn an incomplete row. 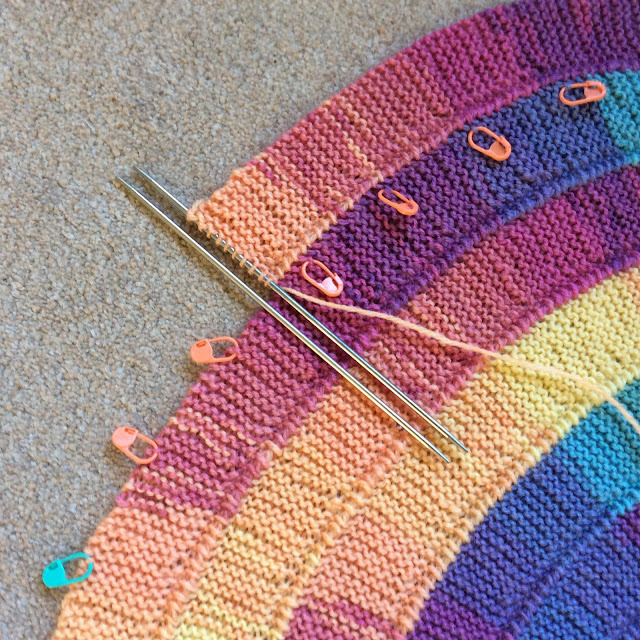 I only figured out that I can use stitch markers where I need to do this when the blanket was almost finished. Silly me! The only slight problem I had was with the centre of the twist - I made it too large and so as I was knitting around it the whole centre bulged out and looked more like a hat rather than a flat blanket. 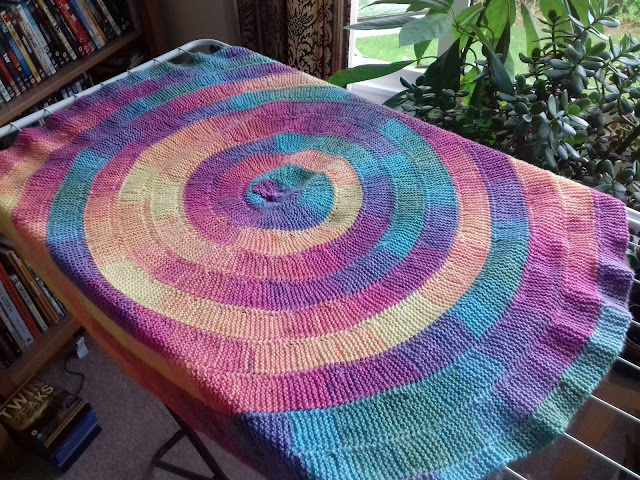 I came to terms with this but in the end once I have soaked and stretched the blanket and let it dry the centre was almost as flat as the rest of it. This year I have spent many happy hours on the plot. I have enjoyed the landscaping bit which included a lot of digging and weeding, filling the compost bins and moving and sifting a lot of soil. We have divided the plot, transplanted the donated plants, repaired and re-positioned the cold frame, brought and planted my own plants and finally sown some more. 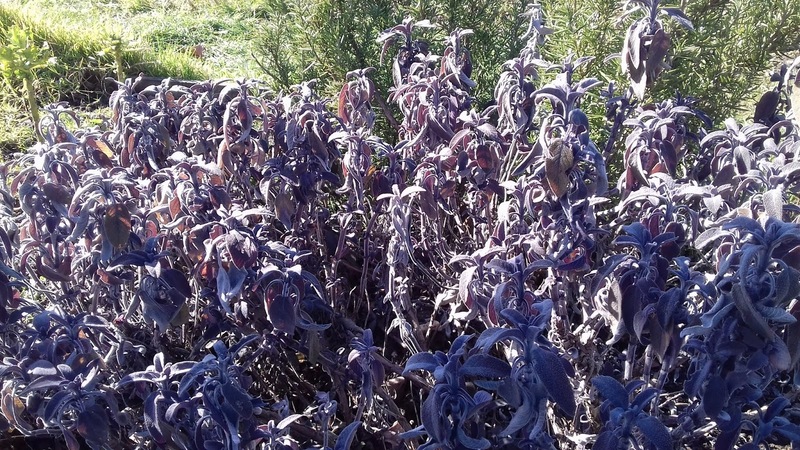 Because of the really odd weather (heat waves and two loads of snow in April and as low as five degrees earlier this week) some plants suffered. My climbing beans did not make it. 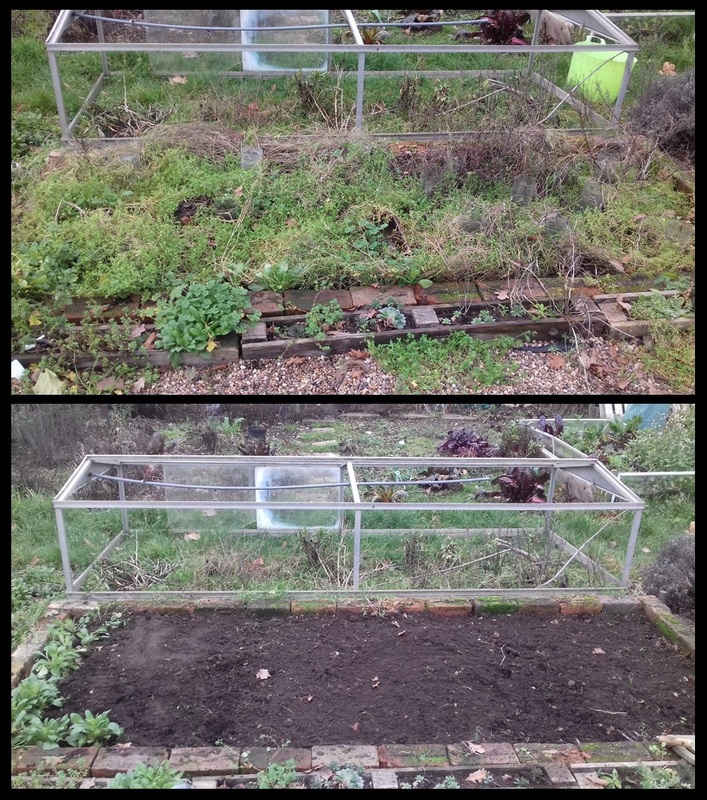 Surprisingly the tomatoes and peppers in the cold frame are still going, even if they look a little bit sad. The nasturtiums are well and the broad beans got nibbled but are setting flowers. With the sun out everything has accelerated. The insects, the spiders, the crops and of course - the weeds. 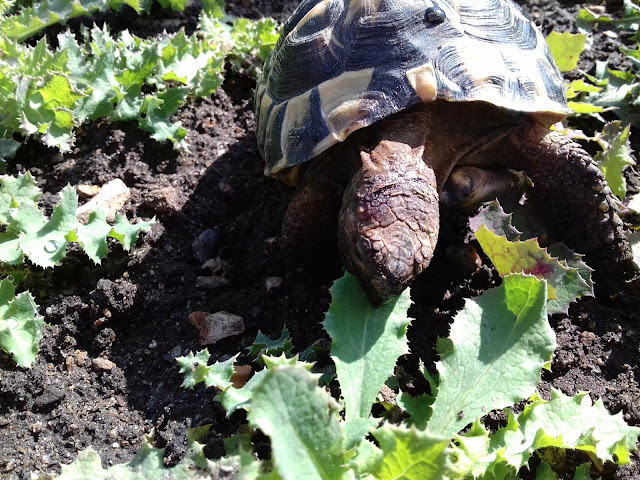 However, that is good news for Rocket who is very eager to help with thistles, dandelions and dead nettles :) I even created a little weed bed for her on my plot and tried out a pet run for the first time. We now have flowering blueberries and strawberries and even tiny little gooseberries! And it's only the beginning of May! I don't usually visit the plot on weekdays but on Thursday the weather was so nice that I was drawn outside. 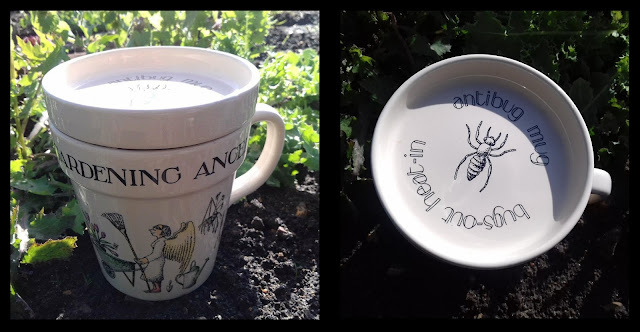 I checked a charity shop on my way and found this - an antibug mug! I don't have problems with bugs in my tea, but I often end up throwing soil into my drink by accident so this is a perfect solution. Funny how sometimes things work out, isn't it? This chunk of land really is my happy place. Hope you had a joyful Saturday, too. 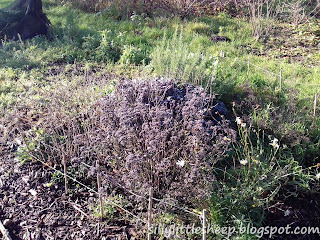 I have been away from the blogosphere for a long long time. Not because anything particular has happened, just general everyday stuff. However, I tried to embrace everything that life brings and enjoy the little things that bring a smile to my face and so far it has been a good year. 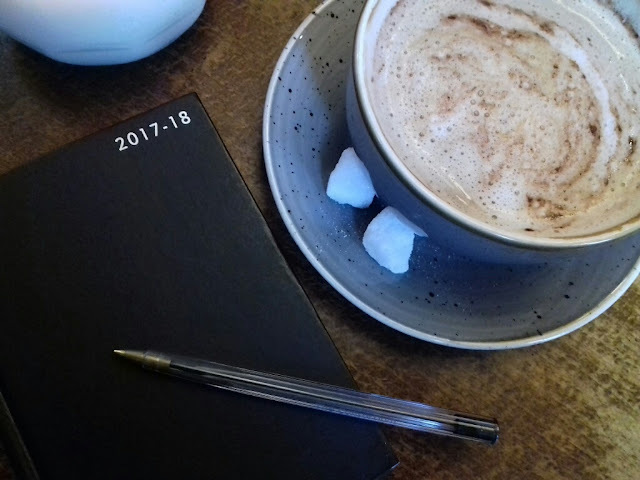 It seems such a bloggers’ cliché to say that I cannot believe it’s already February, but at the same time I don’t remember much of the January we have had, if I am to be honest. It just whizzed past us. Working, eating, sleeping, gardening, all the good things which I was enjoying rather than writing about for you to enjoy. So I am back now (only for a while though, before it stops raining and I can run to the allotment again). 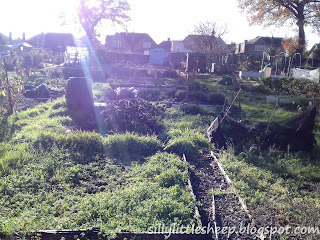 From the very morning of the New Year’s Day we were frequent visitors on out allotment, plot 22A. 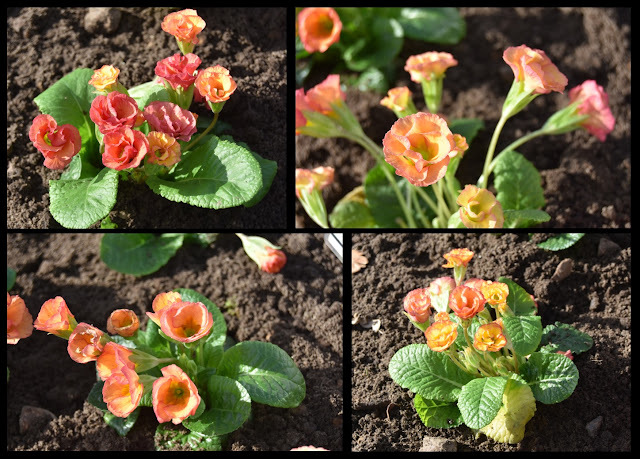 One of the first things I did was to plant some primula plants that we bought the previous day. I decided that we need something pretty there to look at and keep us going whilst the other parts of the plot are in a bit of a state. 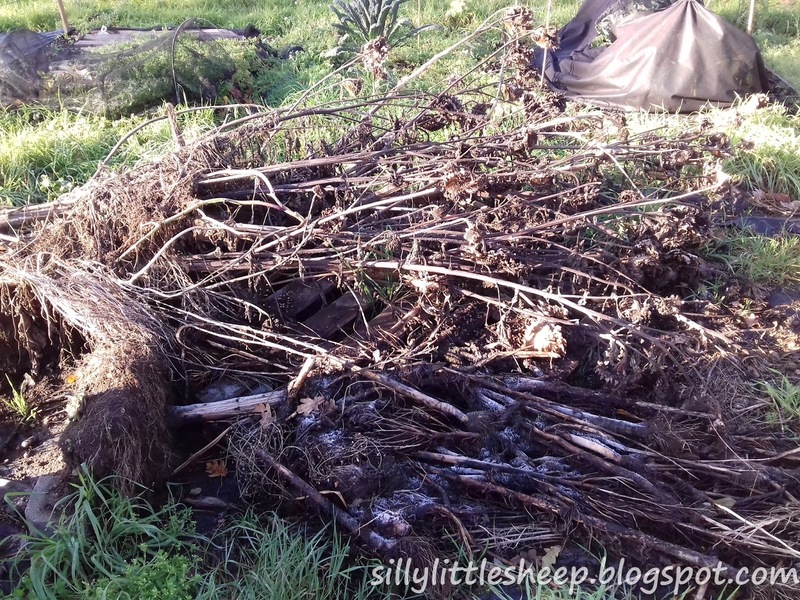 We are still digging up weeds, re-potting plants that I grew at my in-laws’ garden, clearing brambles, setting up a new compost heap… However it is not as bad as some of those really neglected plots you see elsewhere online. All great fun and hard work but awesome exercise. Apart from the green shed there were a few composters, some bamboo poles, a raised bed, a few slightly underdeveloped cabbages, rosemary, sage and some other herbs I do not recognise. On the front of the plot there are some spineless blackberries and what looked like blueberry bushes (later I found the name tags which confirmed that they are indeed blueberries). 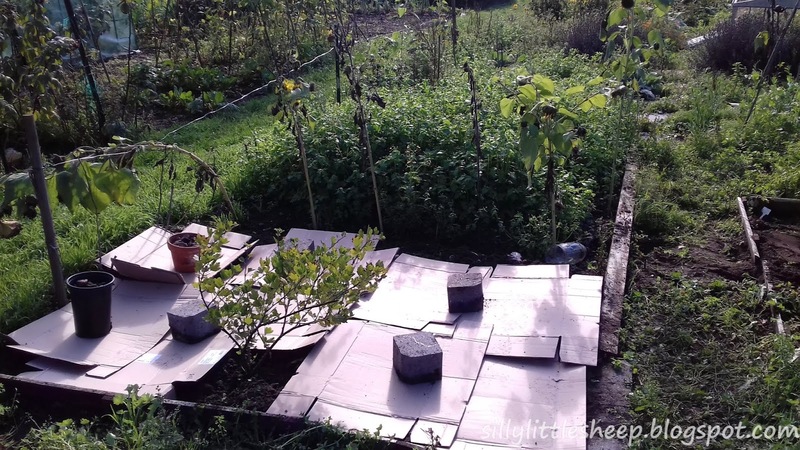 Wooden palettes and strawberry plants were scattered around the plot and even though the composters contained mostly plastic rubbish rather than compost, we have a whole army of earthworms in the soil! We met many lovely people who are always happy to chat and offer friendly advice and we even happened to run into someone who was in the process of letting their plot go so they were clearing it out and donated a lot of things to us, such as a water barrel, functional cold frame, crowns of rhubarb and raspberry plants, just ready to pop in the ground. I have moved all strawberries into a new bed, am collecting rainwater and planning to build a mini pond and a temporary outdoor enclosure for Rocket to enjoy the UV light and fresh food whilst I do my gardening. 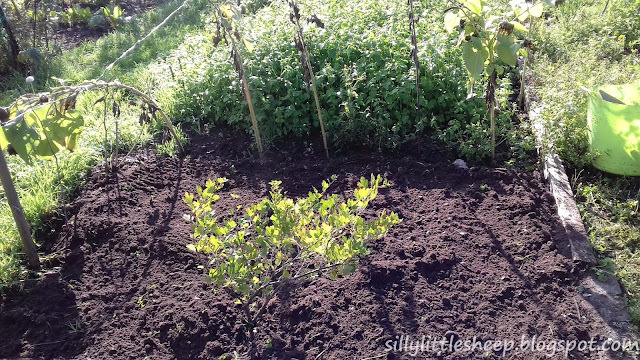 As I was weeding last weekend on a rare sunny day, I realised that this time of the year, even though it was only January, felt more like March or April back at home. 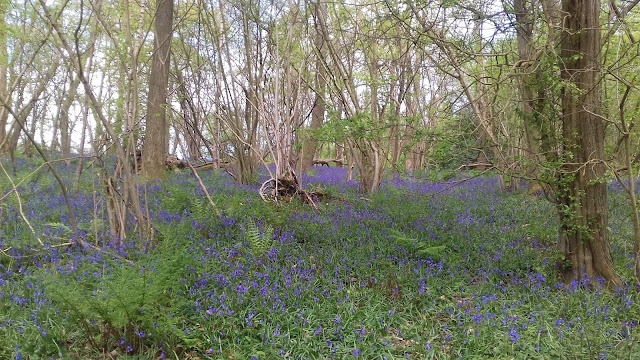 There was something in the air, the smell of soil and weeds (many of which I did not recognise but I definitely knew that I have smelled them before - funny how human senses and memory work, isn't it?) and it felt so warm and encouraging, like from now on we should not have winter any more and everything should just get on with it and grow. Dear friends, I wish you all a great year 2018.
and appreciate life's little beautiful details like this leaf of avocado plant appreciates the sun. As a teacher I find that the "real" end of the year is in July when the academic year finishes. That is when I truly get to sit back and take stock of the year that has passed and I start making plans for the next one and get to wind down during the amazing summer holidays. However nobody can escape the Happy New Year messages and resolutions being taken up all around. I have given up on resolutions fr now, I just want to be a good person and lead a good and possibly healthy and stress-free life, doing the best I can in every way. However, earlier this week I visited London with a friend whom I have not seen for more than three years. We walked through cold and sleeting London for three hours before he got on a bus that would take him back home. After that, having been chilled to the bone, I have set up base camp at a nearby pub. It took a cappuccino, fried vegetarian breakfast and a cup of mulled wine to warm me up, but whilst sitting there, people watching and sipping the hot yummy drinks, I started thinking about this year and the year to come. Now that I am wrapped up warm and sipping hot peppermint and nettle tea at home, I would like to share my thoughts with you. This was the year in which we celebrated our first wedding anniversary. We cooked, had takeaways and ate out. I baked savoury treats for the Macmillan Coffee Morning. 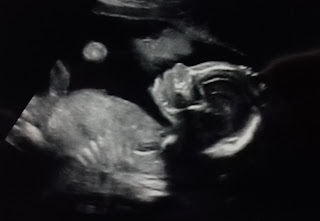 Whilst we relaxed at home we watched a lot of telly, explored the lure of virtual reality, I knitted blankets and baby booties, babysat and cuddled my niece, we planted potatoes and shared meals together and video chatted with my friends and family via Skype and Facebook messenger. Educating my niece. 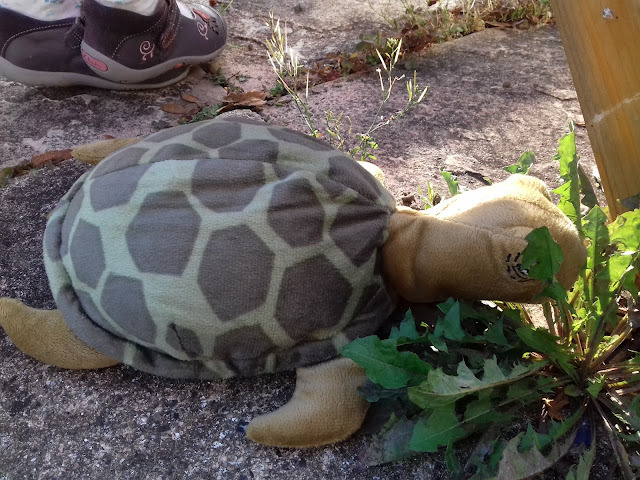 We fed the plush tortoise some dandelions. It was adventurous, too. I camped out with my students as a part of Duke of Edinburgh awards, barbecued, met some old colleagues and spotted badgers during a night time walk. I tried scuba diving in Woking pool and we took a trip to Lulworth Cove in Dorset. In summer I took the almost three weeks long trip to Greece on my own and fulfilled a lifelong dream of working with marine animals whilst I tagged loggerhead turtles with other volunteers. I missed my home and husband a lot and it made me realise not only where my roots are and where I belong but also how much I love where I am right now and what I do. It was a very good feeling. Having lunch in the shallows on the last day of my volunteering n Greece. I got out more. I foraged for blackberries, harvested bits and pieces from the garden, took our tortoise Rocket for outdoor adventures, saw Reggie Dabbs talk to my students, went to a food and drink festival and Ocean Film Festival. 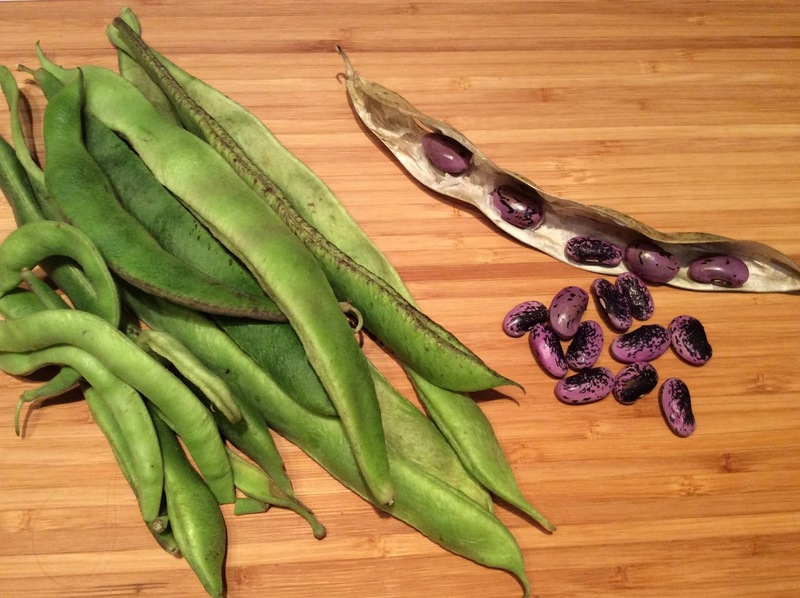 The last of our beans, picked just two weeks before Christmas. I have learned how to take better pictures and gave pottery classes a go. I have tried and failed to go off my anxiety medicine, but on the other hand with the support of everyone around me I got well enough to overcome my anxiety and found a new dentist (and he is awesome!) and GP (she is awesome, too!) and even started taking driving lessons (my instructor is awesome too, I am starting to realise how lucky I am to be surrounded by so many amazing people) and I feel more connected to the world than ever before. I contacted some old friends and uni classmates hoping to rekindle our friendships and catch up on everything they have been doing. Yes, there were rough patches but that is just life. I am hoping that the year ahead is going to be equally amazing, if not better. 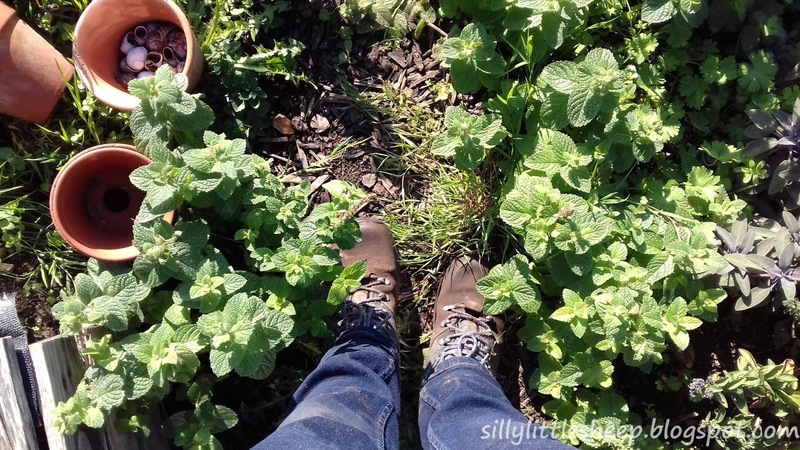 Driving, growing food for us all on the allotment, making more time for friends and family and who knows - maybe finally finding and buying a home of our dreams. I am sure the year ahead will be full of surprises and I am glad that I have people like you to share them all with. I hope your old year was lovely and you made a lot of memories you will treasure and that the new one will be full of opportunities to fulfil your dreams. Greetings! 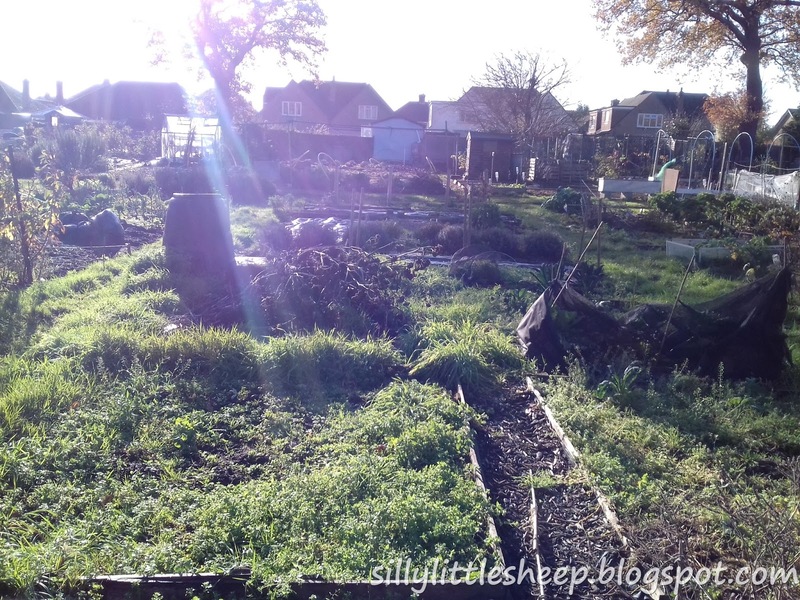 Today we have visited our local allotment association and after waiting for a plot for five months, I have signed a tenant's agreement for a five rod (roughly 5m x 25m) plot . Until the end of the year the plot belongs to the current tenants who need to remove all of their property from there. At the moment there are blueberry and blackberry bushes, some lavender plants, sage and rosemary and quite a cure green shed with tiny patio made of stepping stones. I would be quite happy if all of these items stayed where they are but to be honest, I am so excited that even if the plot was covered in waist high weeds, I would still be jumping with joy. Even though it was a cold November day and the water in the barrels was covered with a layer of ice, there were still some plants with flowers on and vegetables growing. This is one thing that I like about mild English winters. When we got home and had some lunch I went through my big box of seeds and wrote a plan of what to sow when and when to harvest it. At the moment is all green and brown and grey and large portion of the beds is covered with black plastic, but in my head I can see how amazing this piece of land can be, with all of the greenery, flowers, veg and fruit bushes, bees buzzing around and birds chirping and in the middle of all am I sipping a cup of tea and observing it all, being a part of it. I look forward to feeding us better and feeding Rocket better and spending my Saturdays outdoors with other creatures rather than watching telly at home. And the best of all - the management is ok with me building a temporary tortoise run for Rocket, so even when we don't have a garden where we live, she can be getting her UV light whilst I am growing us both some food. It's a win-win. Happy Sunday evening to all! After a really busy week this weekend was like a gift to the soul. I slept, drank a lot of tea and coffee, we visited family and did stuff together and there was lots of sitting down and watching "Stranger Things" and most of all knitting and taking pictures of knitting. Just before we went away to Lulworth Cove, I started a new project - a knitted fifteen stitch blanket. I have never been much of a knitter, all I could do were squares and rectangles (like the ones for my friends' baby blanket) until one of our friends visited and in an afternoon she taught me all about knitting and purling and following a pattern. Pinterest then threw this free pattern for a "ten stitch blanket" in my path and I was intrigued. I must admit, it wasn't easy to begin with, after knitting an initial square comes literally the hardest part of the pattern - knitting a corner and then straight away another corner! I did a training piece with some leftover old yarn just to practice and stayed up until after midnight on the day before the holiday - I knew that if I went to bed, I wouldn't fall asleep because it would bug me so much. 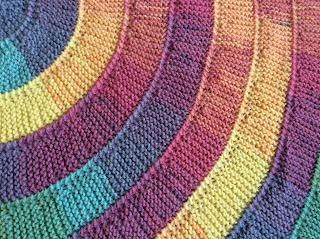 Every row is only ten stitches wide and joining them onto the body of a blanket was another tricky bit for me - the pattern describes two different ways that create different effects, but I was so lost that I had to go on Youtube and just watch some videos of other people knitting it. I am quite pleased with what is coming out. 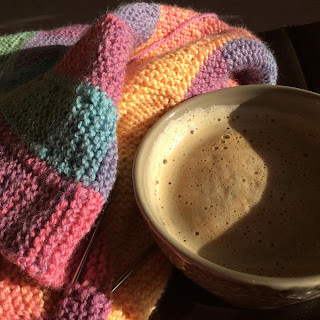 As the blanket grows the corners get further apart as well, which makes the whole task easier and even the corners are now beginning to feel familiarly repetitive - ideal to enjoy whilst listening to something good and drinking coffee! So, having my practice piece done and roughly knowing what I'm doing, we stopped at Hobbycraft on our way to Dorset and I bought a couple of balls of Sirdar Hayfield Spirit yarn (20% wool, 80% acrylic). I wanted to make a blanket in colours of autumn and I wasn't particularly pleased with the blues and greens, but that was the closest they had to what I wanted and I went with it. Now that a big chunk is done, I think they look great in there. The instruction on the yarn suggested that I use 4mm needles but because I like my knitting dense, I went with 3mm ones. 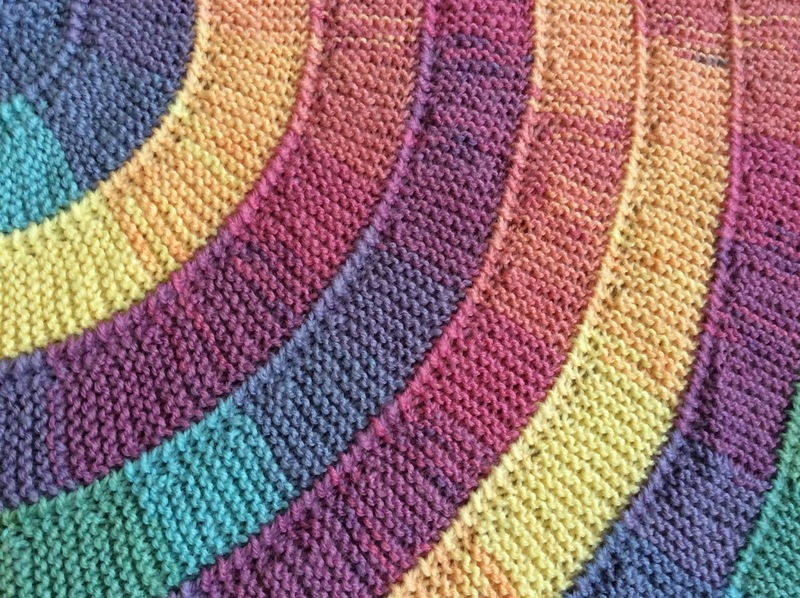 Also, the pattern is called ten stitch blanket, but I changed it to fifteen. With a yarn thin as this I thought the rows might look too narrow. 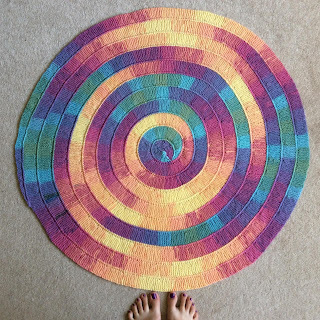 I am glad I did this, because this pattern needs quite a lot of turning around, since the rows are so short. However, as you see in the picture below, I must have dropped a stitch somewhere, because there are only fourteen on the needle. I have literally no idea when this happened. I regularly take my blanket to work to share progress with my crafty colleagues and sometimes, just for the sense of achievement, I put a stitch marker into the first row I knit that day and at the end of the day I marvel at how much I have done (which is not that much at all compared to what I did on holiday). I would say so far it is looking great. 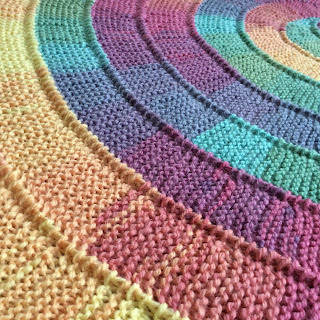 this is the blankie on our dining table with barely two balls of wool worth of knitting. The loose ends will be woven in later. 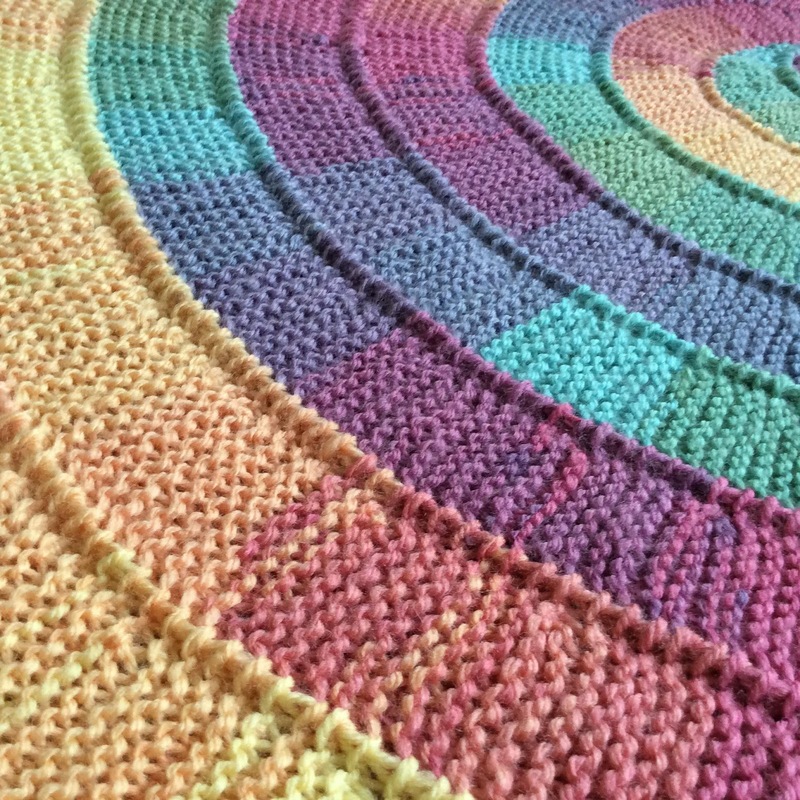 I have also discovered a Tunisian crochet version of this pattern, which I am sure I want to try in the future (it has the added bonus of only working with one tool, not having so many loops on the hook most of the time and no turning at all!). 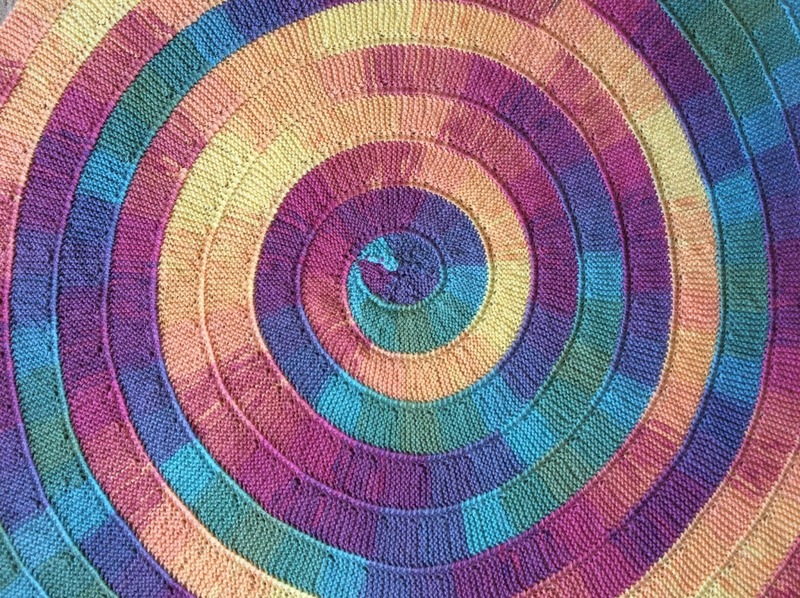 On one hand I cannot wait for it to be finished so that I can just wrap myself in all of the colourful warm fluff and on the other I want it to take as long as possible to savour every single day that I spend working on it, because I am really enjoying it.